Pursue your creative practice in the Clarence Valley and be paid to do it by applying for an Artist in Residence program at the Grafton Regional Gallery. Artists and curators from all disciplines are invited to apply for the 2013 Artist in Residence program. The Grafton Regional Gallery’s aim is to provide an environment for artists to pursue their practice. The residency supports new work, research and collaborations. Accommodation, studio space and a stipend payment are provided. The Studio is located at the Grafton Regional Gallery with additional work space at The Grafton Shopping World in the Link Arcade. The 2013 residence must be conducted for at least a period of four weeks and completed before Sunday 22 December 2013. Applications for the 2013 Artist in Residence program close at 4.00pm on Monday 11 March 2013. 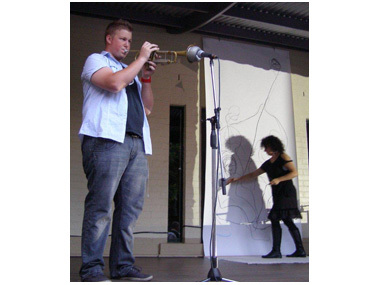 The Artist in Residence program is possible through the support of Arts NSW and Grafton Shopping World. Download an expression of interest from at www.graftongallery.nsw.gov.au or call the gallery on 6642 3177. The Grafton Regional Gallery is a major cultural service provided by the Clarence Valley Council. It is located at 158 Fitzroy Street Grafton and is open 10.00am to 4.00pm from Tuesday to Sunday.